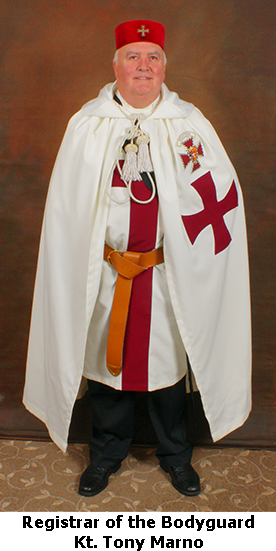 The Provincial Prior’s Bodyguard is made up of representatives of most of the Preceptories in the Province of Monmouth and South Wales. Its duty is to accompany the Provincial Prior on his Official Duties and to provide support to the Prior and his Provincial Team. The Bodyguard prides itself on being a well-disciplined, well-drilled team of Knights for whom attention to excellence in sword drill and perambulation is extremely important. The composition of the team is constantly refreshed, as when Knights progress into the Office of Constable in their Preceptory they can no longer serve on the Bodyguard. The Bodyguard has a camaraderie that is unique, and have their own Preceptory, open only to present and past members of the Provincial Prior's Bodyguard. Should you be interested in joining or finding out more about the Provincial Prior’s Bodyguard please contact the Bodyguard Registrar or your own Preceptory Registrar.